If you like to watch your feathered friends gather in your yard to enjoy some tasty seeds that you have provided for them, but are tired of watching those cute, but oh so pesky squirrels stealing all of the bird seed, then finding a squirrel proof bird feeder is a must. Finding such a feeder may be somewhat more difficult than you would think, as most squirrels are pretty smart little rodents and they will do their best to find a way to get some of those tasty bird seeds and treats for themselves. The Brome Bird Care company is a Canadian company that specializes in squirrel proof bird feeders. Their Brome 1024 Squirrel Buster Plus Wild Bird Feeder With Cardinal Perch is one of their most popular feeders. This tubular bird feeder looks handsome when it is filled with seeds, and it has a perch to allow the birds to rest while they enjoy their meal. It will look good hanging in your garden, from your deck, or from a tree. Reviews for this Brome Wild Bird Feeder are exceptional, with most people really liking this feeder and stating that it does exactly what it claims to do. Some customers do point out that this is a rather pricey bird feeder and that if it is not hung up high enough, the deer can shake the seeds out of it. While it is more expensive that many other bird seed feeders, when you consider how much bird seed is lost to squirrels, then this higher price may be worth it for most people. 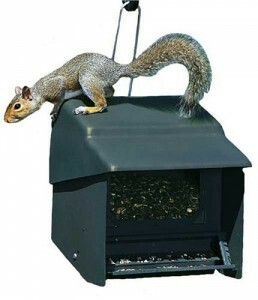 Another popular squirrel proof bird feeder by Brome is the Squirrel Buster Peanut Plus. This feeder holds peanuts or wild bird food nuggets that are extremely attractive to some types of birds. If you enjoy seeing your yard or garden filled with woodpeckers, chick-a-dees, and other clinging type birds, then you will love this handy bird feeder. Reviews for the Brome Squirrel Buster Peanut Plus Bird Feeder are excellent. While some customers don’t like the fact that this feeder attracts some of the bigger birds, such as blue jays, most customers really like seeing the variety of birds this feeder attracts. Homestead is a family owned and operated division of the Gardner Equipment Company. They are manufacturers of beautiful metal bird feeders designed to last for years. One of their more popular products is the Homestead Super Stop-A-Squirrel Bird Feeder. The Stop-a-Squirrel Bird Feeder is dark green and should blend in well with any trees you have on your property, making for a more comfortable sight for those birds you are wanting to attract. There is a nice overhang to help keep the seed dry in case of rain. Reviews for this Homestead Stop Squirrels Bird Feeder are quite good. While some customers do feel that this feeder should have a larger perch for bigger birds, other customers state that, while this feeder may slow squirrels down when getting at the seed, some smart squirrels have managed to get into this feeder. Woodlink manufactures and markets recycled plastic “Going Green” bird feeders and houses, as well as traditional cedar bird feeders. Their Woodlink NA7511I Audubon Bird’s Choice Squirrel Proof Feeder is quite popular with customers and birds alike. This bird feeder looks neat and tidy and should look good in anyone’s yard or garden. It is easy to picture this feeder mounted on a pole with flowers all around it, and then looking out at all the birds feeding and butterflies flitting around. There are only a few reviews for this Woodlink Squirrel Proof Birdfeeder, but the reviews that are available are outstanding. Perky Pet is one of the brands of bird feeders offered by BirdFeeders.com. The Perky Pet brand is known its functional and innovative bird feeders, one of which is their Perky Pet 312C Panorama Bird Feeder In Copper. The Perky Pet Bird Feeder is very attractive with its copper finish. It will look good hanging from a deck, or anywhere in the yard or garden. Reviews for this Perky Pet Copper Bird Feeder are good, with most customers liking this birdfeeder’s style and function. However, there were some customers who felt disappointed in this feeder, as they either received the feeder broken, or it broke or rusted shortly after purchase. While this was the exception rather than rule, it does occur often enough to bear mentioning. Having a squirrel proof bird feeder can help keep you from going broke while feeding your feathered friends, and can give you hours of pleasure and you watch the vast variety of birds attracted to your garden.